One of those emails that floats around. First you must learn to pronounce the city name. It is DAL-LUS, or DAA-LIS depending on if you live inside or outside LBJ Freeway. Dallas has its own version of traffic rules… ‘Hold on and pray.’ There is no such thing as a dangerous high-speed chase in Dallas We all drive like that. The morning rush hour is from 6 to 10. 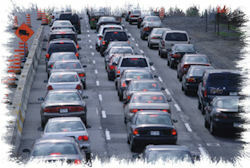 The evening rush hour is from 3 to 7 Friday’s rush hour starts Thursday morning. If you actually stop at a yellow light, you will be rear-ended, cussed out and possibly shot. When you are the first one on the starting line, count to five when the light turns green before going to avoid crashing with all the drivers running the red light in cross-traffic. Construction on Central Expressway is a way of life and a permanent form of entertainment. We had sooo much fun with that; we added George Bush Freeway, the High Five to the mix and now are building the LBJ Express! The North Dallas Tollway is our daily version of NASCAR. The minimum acceptable speed on the Dallas North Toll Road is 85 mph; anything less is considered downright sissy. Oh yes It also ends in Sherman ! The wrought iron on windows near Oak Cliff and Fair Park is not ornamental!! A trip across town east to west will take a minimum of four hours, although many north/south freeways have unposted minimum speeds of 75. It is possible to be driving WEST in the NORTH-bound lane of EAST NORTHWEST Highway ; don’t let this confuse you. If it’s 100 degrees, Thanksgiving must be next weekend. If it’s 10 degrees and sleeting/snowing, the Fort Worth Stock Show is going on. If it has rained 6 inches in the last hour, the Byron Nelson Golf Classic or Colonial is in the second round (if it’s Spring) – and it is the Texas State Fair if it’s Fall. If you go to the Fair, pay the $8.00 to park INSIDE Fair Park . Parking elsewhere could cost up to $2500 for damages, towing fees, parking tickets, and possibly a gunshot wound. If some guy with a flag tries to get you to park in his yard, run over him. Any amusement parks, stadiums, arenas, racetracks, airports, etc., are conveniently located as far away from EVERYTHING as possible so as to allow for ample parking on grassy areas. I just got off the phone with my brother who’s in Dallas! Don’t like driving in Dallas. It is better than Houston. I prefer Ft. Worth. The drivers & people are nicer and of course it is my hometown. LOL too cute. Josey Lane really threw me off as a new driver when I was in school in Dallas. I remember being to afraid to leave campus at times. Many nights in the dorm because of crazy Dallas drivers lol. Dallas just scares me. Where did you go to school?